Since Infinix released the XOS update for the Infinix Note 2 and Zero 3. Lots of users who actually upgraded their phone to the latest OS have been complaining about them not being able to root the phone with different root apps like the KingRoot. This is pretty obvious since the new XOS update is based on Android version 6.0 marshmallow. And since its still a pretty new OS version, most root apps such as KingRoot don't have the exploit to successfully root this phone so you might need to do it manually by flashing SuperSU.zip through a custom recovery. ==> Vcom Preloader driver installed. Check installation guide HERE. => Sp flash tool. Download HERE. => Infinix Note 2 XOS Twrp Recovery. Download HERE. => Open the folder of the Sp flash tool you extracted and launch the file named "flash tool.exe". => On the flash tool app, click on scatter loading at the top right corner. => Once it loads up, click on download at the top left corner of the sp flash tool. => Turn off your phone first and connect it to your PC. => Just wait while sp flash tool installs the recovery image into your phone and you should see a green button once the installation is completed. That is just about the first stage and you are through with the Twrp recovery installation. The next thing now is to root your phone by actually flashing a SuperSU.zip through the recovery mode. => Download SuperSU.zip from this link and copy it into your external SD card. (don't put it inside any folder). => Turn off your phone and boot it into recovery mode by holding down both the power button and volume up button. => From the Twrp menu options, click on install and select SuperSU 2.76.zip. => Swipe to confirm and wait until the process is completed. => After that, just reboot your phone. You have just successfully rooted your Infinix Note 2. You can go ahead and confirm if it was successfully rooted by downloading root checker from play store. 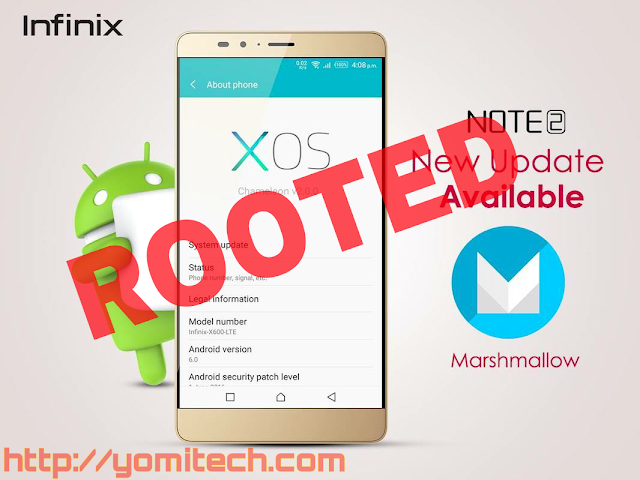 Make sure your phone is on Android 6 Marshmallow or just try the latest kingroot..
Would this still work in 2019?